Corn is one of my favorite vegetables, and I enjoy eating it in many forms – grilled corn on the cob, cornbread with honey butter, and, yes, canned creamed corn. Actually, when I was younger, I used to eat creamed corn with evaporated milk and sugar. I loved it! Even as a kid, I had an insatiable sweet tooth. Who doesn’t like blueberries? They’re not only good, but they’re also good for you. Dubbed one of the superfoods, blueberries are packed with antioxidants, high in potassium and Vitamin C, and they’re a good source of fiber. There’s certainly a lot of nutrients packed in this fruit. I had never eaten them together before, but I was sure they’d make a great pair, and I was right! The addition of the plump, ripe blueberries and fresh corn kernels transformed the usually savory corn muffins into lighter, sweeter treats. I love the contrasts in these muffins. The deep blue color of the cooked blueberries are set off wonderfully against the sunny yellow backdrop of the cornmeal. The muffins are further accentuated by the bold purplish tinge of the blueberry-flavored mascarpone cheese. The contrast in flavor and texture is also quite pleasing. The sweetness of the corn, at it peak of flavor, is paired very well with the slight tartness of the blueberries. I used Bob’s Red Mill stone-ground Fine Grind Cornmeal for this recipe, which gave the muffins a slightly crunchy texture and a very nice corn flavor. While these muffins can be eaten any time of day, I like them best for breakfast, with a generous amount of the flavored mascarpone cheese on top and a cup of coffee. Now on to the giveaway! I connected with some great folks from Bob’s Red Mill at a food blogging conference in Seattle last month. I was already familiar with the company, and at the conference, I learned even more about their story and their high-quality products. A couple of weeks later, I accepted a company representative’s offer of some complimentary products to try. I have been very pleased with the Bob’s Red Mill products before I even started blogging, and I continue to be now. Thanks to Bob’s Red Mill for sponsoring my very first giveaway of Fine Grind Cornmeal to make this recipe or your favorite recipe using cornmeal. Three (3) winners will each receive one (1) bag of Fine Grind Cornmeal directly from Bob’s Red Mill. Giveaway ends Sunday, July 29, 2012, 11:59 pm PDT. Winners will be announced on Monday, July 30, 10 am. To enter, simply Leave a Comment telling me your favorite recipe using corn or cornmeal. You can leave more than one comment, but only your first comment will be counted as a giveaway entry. Three winners will be picked at random from all those who leave a comment. Heat the oven to 375 degrees F. Place paper liners in a 12-cup muffin pan and set aside. Melt the butter in a medium skillet and add the corn and 1/4 teaspoon of salt. Cook over medium-high heat until barely tender, about 3-4 minutes. Remove from heat and cool corn slightly. In a medium bowl, whisk the cornmeal, flour, 3 tablespoons of sugar, baking powder, and remaining 1/4 teaspoon of salt until combined. Add the buttermilk, egg, and oil to the flour mixture and stlr until blended. Add the corn mixture and stir until combined. Place 2 to 3 blueberries on the bottom of the muffin cups. 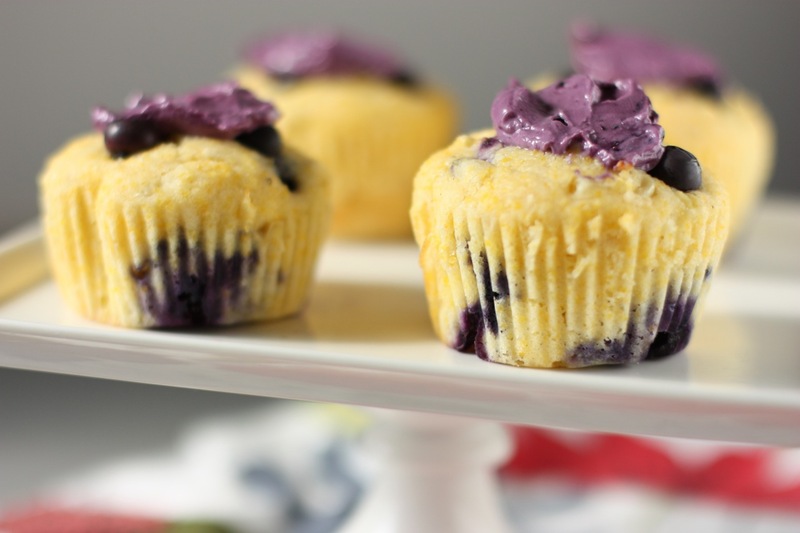 Fill the muffin cups halfway and place 2 to 3 more blueberries on top of the batter. Spoon the rest of the batter evenly into the muffin cups. Add more blueberries to the top, if desired. Tap lightly on the counter to even out the batter. Bake the muffins for about 15-17 minutes, or until a toothpick inserted into the center comes out clean. To make the blueberry-flavored mascarpone, combine 1/4 cup of blueberries and 1 tablespoon of sugar in a small pan. Cook until the blueberries are soft, approximately 5 minutes. Stir in vanilla and remove from heat. Transfer cooked blueberries into a food processor. Add the mascarpone and process until mixture is smooth and well-combined. Chill in the refrigerator for about 15 minutes before using. 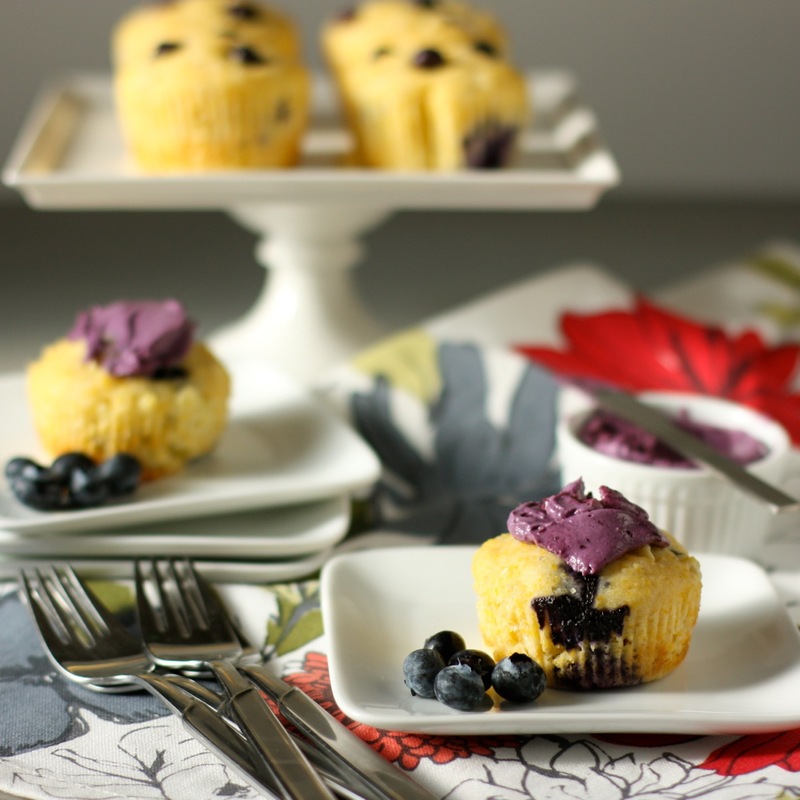 Serve the muffins warm, with blueberry-flavored mascarpone. Adapted from Spoonful, courtesy of Disney. My favorite recipe using cornmeal is the No Melt Suet I make to feed the birds. I like mine with chedder cheese and jalapenos! My favorite recipe is use to cornmeal in an old fashioned cornbread, served with bitter and honey! I like using corn in a corn salad with tomatoes and a vinaigrette. My favorite recipe is using corn to make mexican tamales! I’ve never tried cooking with cornmeal before, but I’m not against learning! My grandma used to make awesome cornbread cakes. I make cornbread all the time, so that might be a default favorite. We make a wonderful corn and chard stacked enchilada in the late summer and early fall, though. Thank you for the recipe and the giveaway. I love just a simple cornbread muffin that is smeared with honey butter! Your muffins look delicious! These cornbread muffins sound fantastic and will be made this week in preparation for our upcoming camping trip! One of my favorites: “Hot and Sassy Corn Bread,” from the not-so-new New Basics cookbook, in which i use stone-ground cornmeal, fresh and canned cream-style corn, and a wee bit jalapeno for just the right amount of sass! Cast Iron Breadsticks and Caramel Rolls! They both use about 1/2 cornmeal and 1/2 flour. Amazing! Favorite cornmeal recipe would have to be my mom’s cornbread cake , served warm with lots of maple syrup, and a big glass of cold milk. Childhood memories! Think I’ll make some tonight! Hi, Susan! Please check your inbox for an email from me on how to claim your prize. I love simple cornbread, although I’ve been seeing some recipes lately for cornmeal pancakes that I want to try. Your muffins sound delish. Can’t wait to try them. My favorite corn recipe is from Paula Deen for a corn casserole. It used Jiffy Mix corn bread muffin mix, creamed corn, sour cream, cheddar cheese and butter. Sweet and tasty. I remember my favourite pancakes were the ones my mother made last from the batch of batter. Corn pancakes – creamed corn in the mix. Never needed syrup, just a small slap of butter. I think she and I were the only ones who really enjoyed them, and they were absolutely worth the wait. yep… those sound pretty childhood memorable. I’ll have to try those sometime. I love cornbread with corn ! I am from the south, so I remember eating a lot of different things made out of cornmeal when I wasyoung, but I cannot remember what they all were!